I have to admit that when I was writing my end-of-the-year article last month about nostalgia, I was preoccupied thinking about something that I wasn't ready to write about yet: our dog Nelly. I first met Nelly at a truck stop in Pennsylvania in the fall of 2002. I lived in Virginia at the time. Our neighbor to the house I grew up in in Michigan had bred her dogs, and after discussing with my mom, she had paid for a chocolate Labrador Retriever—the runt of the litter—on my behalf. My mom and I met at the halfway point in Pennsylvania to exchange cash and dog. For me, it was love at first sight. For Nelly, it was probably pretty scary. She was so timid and didn’t yet have the leash skills to walk with me to my car—or to “do her business” before getting in the car, as I would discover during the drive home. But I would soon learn that Nelly was the most trainable dog I have ever met. I didn’t bother to pursue anything as advanced as field training or agility, but by the time she was six months old, she had a repertoire of tricks and I could walk her off leash with no concerns about her running off—at least unless she found muddy water to play in. Nelly’s trainability came from an eagerness to please. Jackie and I often joked about her “furrowed brow,” as she appeared genuinely concerned with making sure everyone was happy and comfortable at all times. I’m told she is the reason several of my friends have their own dogs today, inspired by Nelly’s warmth, loyalty, and seeming optimism. After Nelly came through a major surgery last year, we considered our remaining time to be “bonus time.” We tried to get every bit of enjoyment we could out of it. If pressed, I would tell you it was not her best year, nor mine. But as I consider this today, I realize that every day we have with our loved ones is “bonus time,” a gift— of both joy and sorrow—that we can choose to enjoy for what it is. On December 3rd, we had to say goodbye to Nelly. 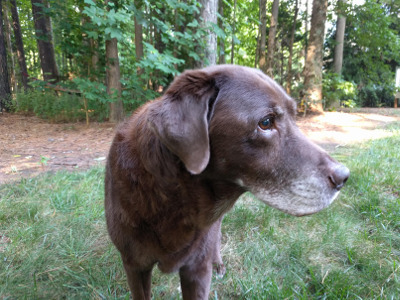 If you’re not a dog person, this probably sounds silly, but I learned a lot from her during her fifteen and a half years, and I am a better person because of her. I could not be more thankful for the time we were gifted with. She was such a good dog.